April | 2018 | What Next? Grant Wood was featured on the CBS Sunday Morning Show yesterday. 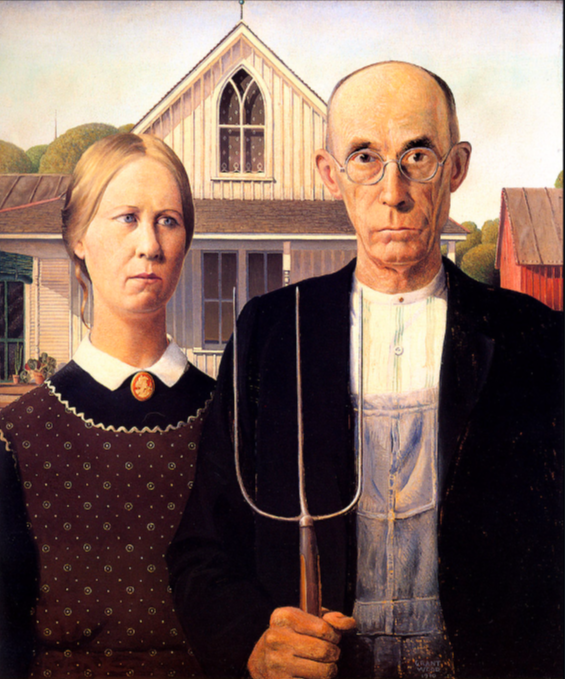 If you are like me the Grant Wood painting you are most familiar with is American Gothic. I was surprised to learn that the models for the painting were Grant Wood’s sister Nan and his dentist Dr. Byron McKeeby. For some reason I had assumed they were a real husband and wife. Nan later insisted that her brother meant this to be a portrait of a father and daughter. One detail I had never noticed is how the image of the pitchfork in the man’s hand is repeated in his overalls. 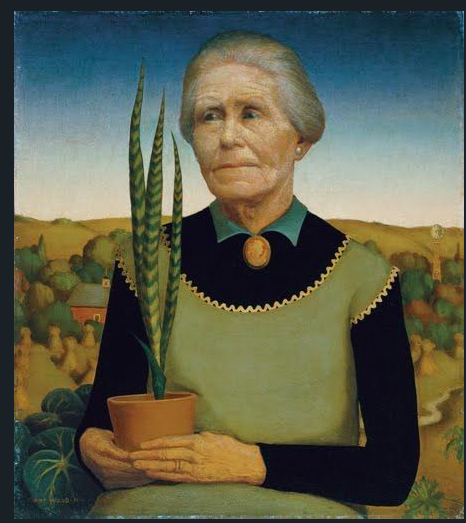 The plants on the porch of the house behind the couple in American Gothic are the same as the one in his mother’s hand and just behind her in this portrait Grant Wood painted of his mother called Woman With Plants. The plant in her hand is called mother-in-law’s tongue and the plant behind her is a beefsteak begonia. Also notice that the cameo his mother is wearing in this painting looks very similar to the one his sister is wearing in American Gothic. Their aprons and sweaters are also of a similar style. 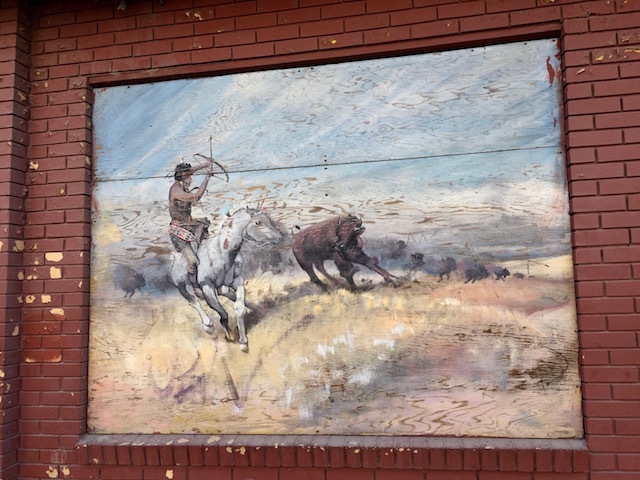 The house Wood used as a model for his painting is now a national historic site. 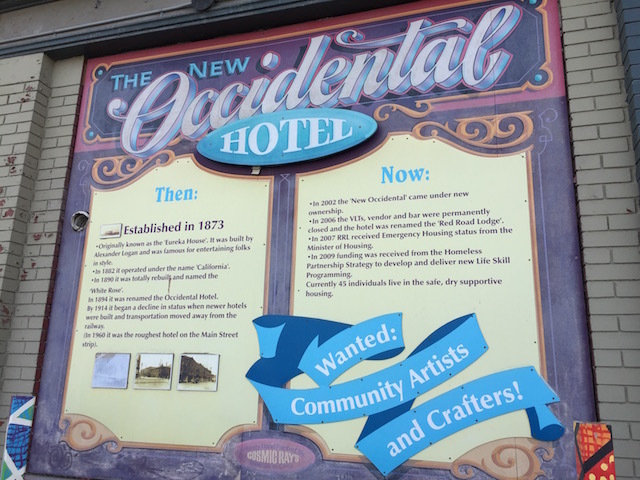 It is in Eldon Iowa and was built by Charles Dibble in 1881. 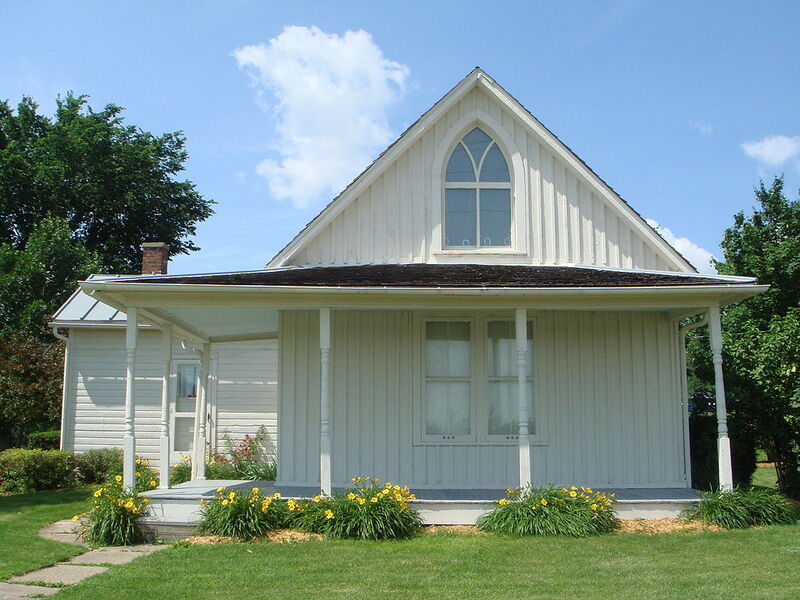 Grant Wood was driving through Eldon Iowa with a fellow painter in 1930, saw the house and sketched it. Later he created the portrait with his models in his Cedar Rapids Iowa studio. The top window of the house looks like a church window and was ordered by the original owner from the Sears catalogue. About 15,000 people a year visit the home and many pose for a photo in clothing similar to that worn by the couple in the original painting. 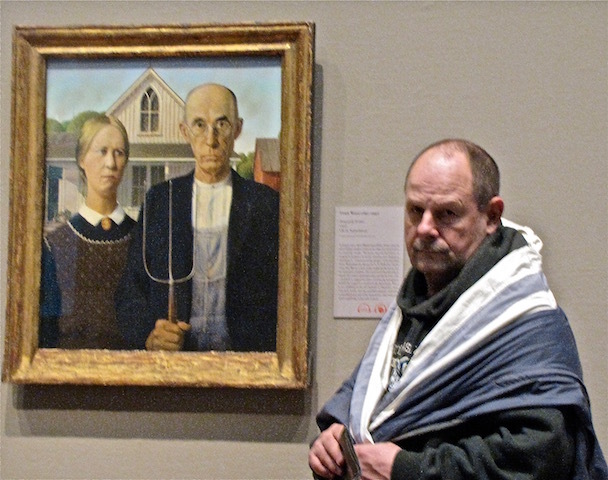 Dave and I saw American Gothic when we visited the Art Institute of Chicago a number of years ago. 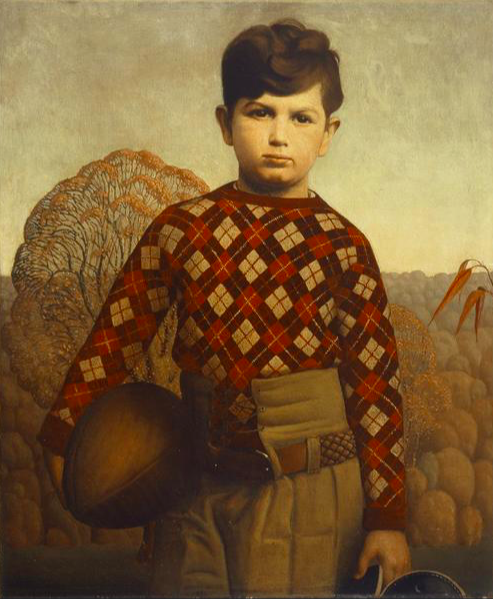 There are questions about what kind of message Grant Wood was sending with this painting. Was it a satire of rural small town American life? Was it a mourning portrait? Wood’s father died when he was only ten years old. Was it a symbol of the steadfast American spirit? 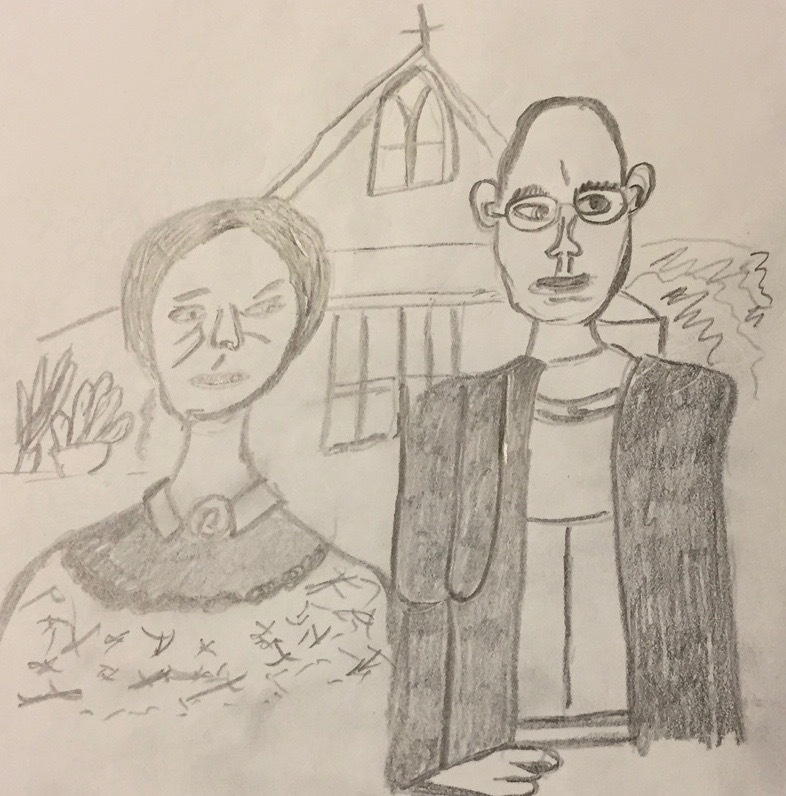 Interestingly in March when we were in Portugal I tried my hand at doing a quick sketch version of my own of American Gothic for one of my daily art exercises. 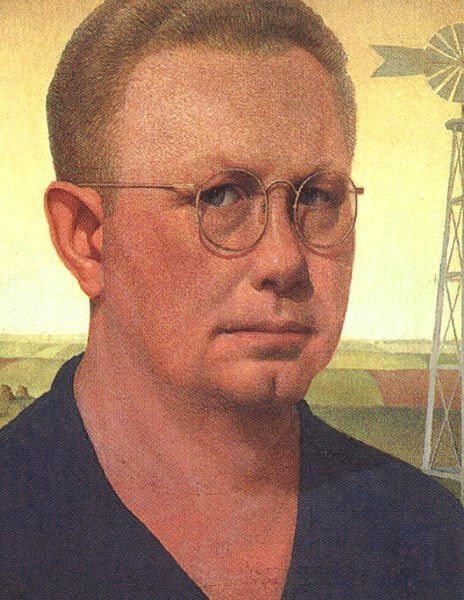 The CBS Sunday Morning Show segment was terrific and I learned so much about Grant Wood’s life and later checked out more than a hundred paintings of his on the Wiki Art site. He created many other portraits besides American Gothic. This one called Plaid Sweater is one of my favorites. Grant Wood was a fascinating man and artist even though most folks only know him because of American Gothic. 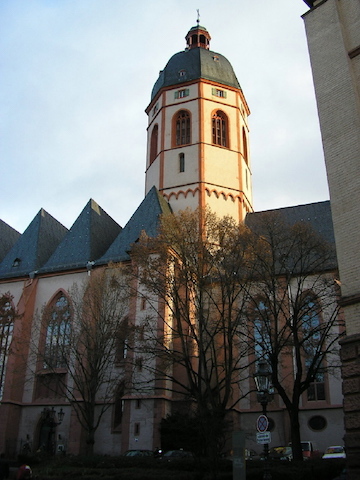 In Mainz Germany I visited St. Stephen’s Church. I saw the nine huge gorgeous stained glass windows in this Catholic cathedral created by the Jewish artist Marc Chagall. 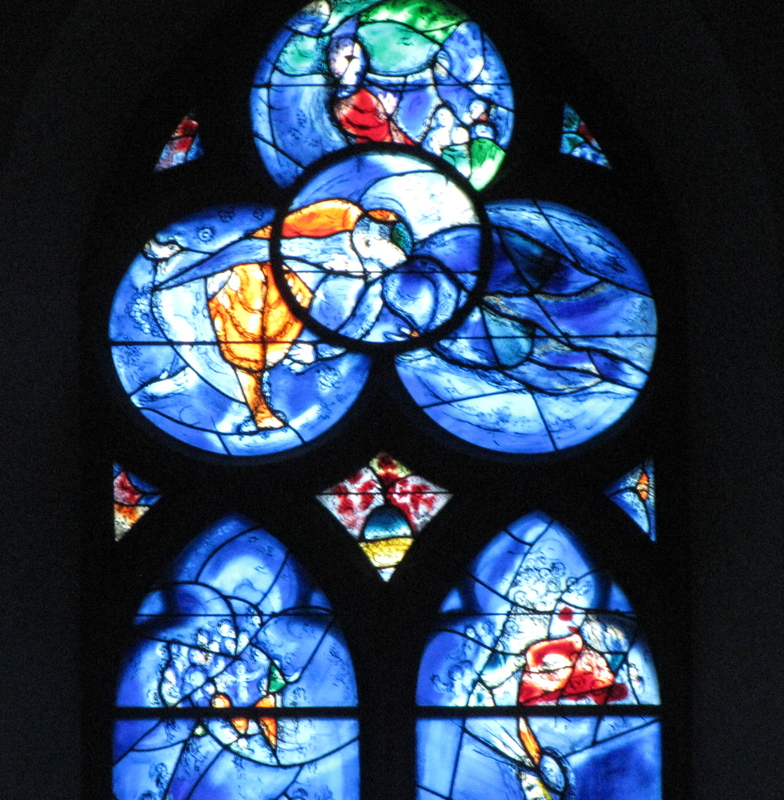 Chagall made the windows in the last decade of his life as a contribution to the Jewish-German reconciliation effort. Chagall himself was forced to flee France after it came under Nazi occupation. 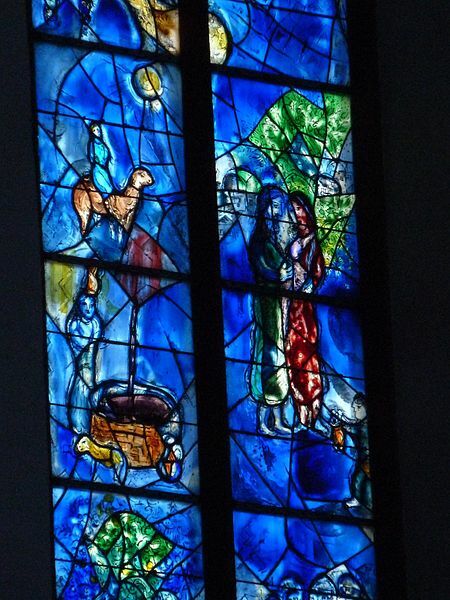 Chagall chose stories from the Old Testament for his windows, stories shared by both Judaism and Christianity. He hoped that the two faith traditions in Europe could build on their common threads and eventually come to the point where they could reconcile and work together for the common good. Note: A SCOBY is an acronym for……..symbiotic culture of bacteria and yeast. You can get a SCOBY from a friend or grow your own. 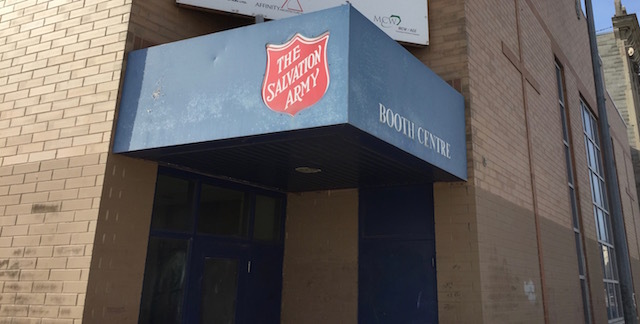 She wanted to find the Salvation Army Thrift Shop in St. Boniface. I told her she could walk with me and once we got to my street I’d show her the direction to go. I told her I volunteered at a Mennonite Thrift Shop. “I’m a Mennonite,” she said. She told me her name. Her first name was Biblical and her surname definitely Mennonite. “Where are you from?” I asked. She named my hometown and as we talked she told me about the schools there she had attended. I had attended all three myself and taught at one of them. When I asked about her parents she described her father with an expletive and said she never wanted to see him again. Her Mom had left her Dad and moved to a distant Manitoba town. We kept talking till we reached my street. I found out she’d been kicked out of high school, had no one in the city she knew, and had no money. There was a limited amount of time she could stay at the Salvation Army. “I’ll have to find a way to make Winnipeg my home,” she said. When we reached my street I pointed her in the direction of St. Boniface, gave her some money to buy clothes, wished her well and waved good-bye. I can’t stop thinking about her. I know there is probably lots more to her story than she told me. But………what will happen to her? What chance does she have? I’ve walked down Main Street from Bannatyne to Selkirk literally a hundred times since I moved to Winnipeg. Yesterday I decided to REALLY look and take some photos of the street I’ve walked so often. 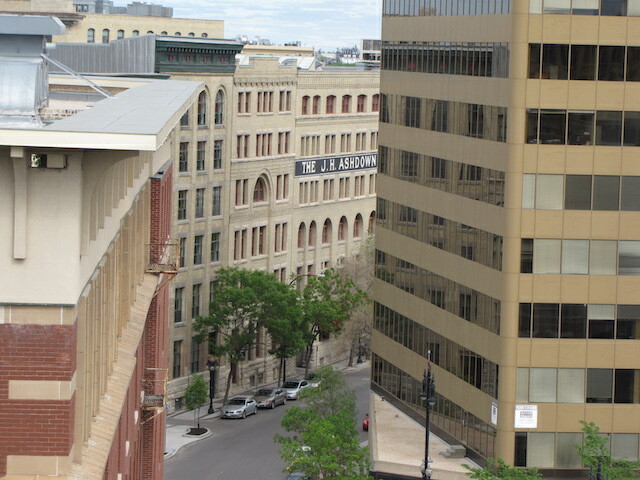 Aren’t You Scared to Live in the Exchange District? 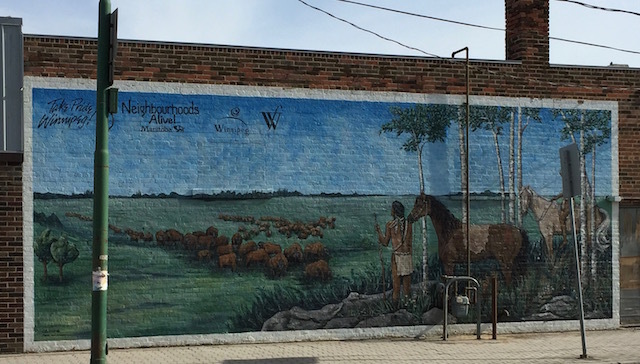 I am just wrapping up a month of visiting Winnipeg schools in my role as a supervisor for education students practicing their craft in the classroom. This year I had the privilege of spending time in three different mixed grade one and two classrooms. I saw amazing things happening in all of them. My student teacher was doing math problems with her six and seven-year olds that involved addition. These kids didn’t have pencil and paper. They were adding three digit numbers to three digit numbers in their heads! They had been taught ten different strategies for figuring out addition problems and not only could they complete the calculations mentally they could tell you which strategy they had used and why they had used it. Different kids used different strategies and that was applauded. It was amazing. They got it! 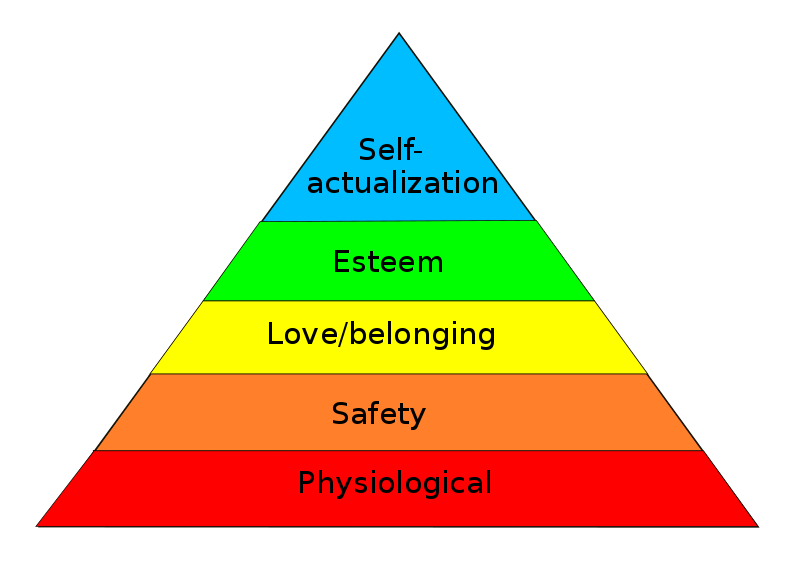 My student teacher had introduced her six and seven-year olds to Maslow’s hierarchy of needs pyramid. First they made a pyramid for themselves. What did they need to feel healthy, safe, loved, good about themselves, to be learners and have fun? Then the teacher read them stories and showed them videos about joeys (baby kangaroos) and they made a pyramid for them. One day I watched them work together as a class to make a pyramid for baby emperor penguins after seeing videos and reading books about them. It was amazing! They got it! My student teacher is Metis and she did a social studies unit introducing her six and seven-year olds to her culture. She used a medicine wheel with them. 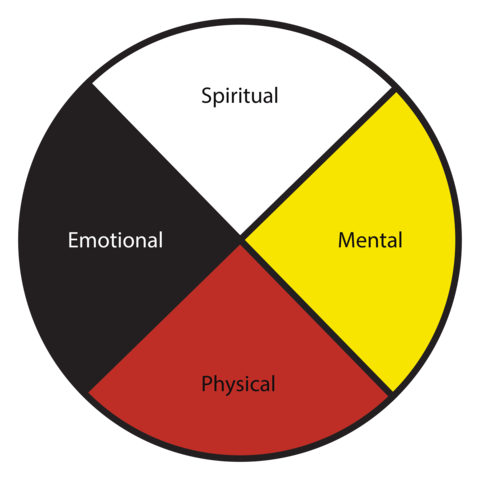 A medicine wheel has four sections emotional, mental, physical, spiritual. I watched one day while the children took special items they had brought from home or had drawn pictures of and they placed them in the “correct” spoke on their own personal medicine wheel. They could explain why they had made the choices they did. A book might go in the mental section because it made them think. A feather might be placed into the spiritual spoke because it reminded them of creation. A picture of a favorite food might go in physical because it filled them up and a photo of a grandmother in emotional because they loved her. It was amazing! They got it! 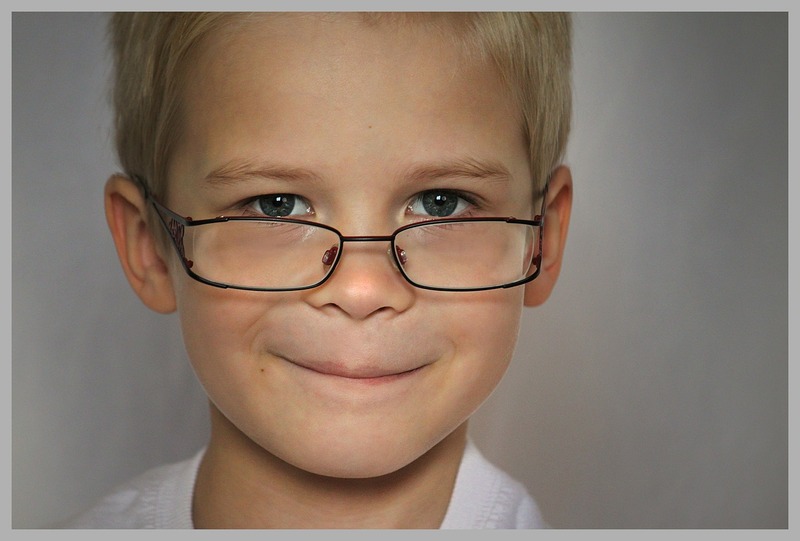 Our schools are often criticized because they aren’t deemed to be doing a good enough job. 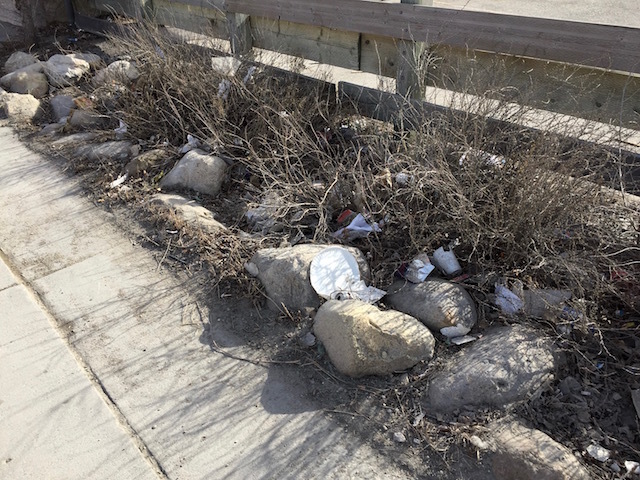 I wonder how many people who criticize actually visit to see the great needs as well as potential particularly in Winnipeg’s inner city schools, to see the great work being done by so many teachers and to see the great kids who are being stretched and challenged to be the best they can be. On Saturday I gave my last tour of the Insurgence/Resurgence exhibit at the Winnipeg Art Gallery. I have toured through the exhibit with hundreds of visitors since last September and have learned so many new things from my tour participants as they pointed out things in the art pieces that I hadn’t seen and shared how the works connected to them personally. At the end of my tour on Saturday I told the group I would be going to see the movie Indian Horse in the evening. Based on the excellent book of the same name by Richard Wagamese the film tells the troubling story of an indigenous boy’s experience at a residential school. One of the women in my group had seen the movie and she said the Insurgence /Resurgence exhibit provided a hopeful balance to the film. The exhibit celebrated the gifts and talents of indigenous Canadians and placed them front and centre. The boy in the film who has a rare talent for the sport of hockey is prevented from celebrating that gift and retreats into a place of darkness because of the prejudice and abuse he experiences. One of my favorite pieces in the Insurgence/Resurgence exhibit was called Gone But Not Forgotten. Made from wood collected along the banks of the Red and Assiniboine Rivers it is a memorial to people who have lost their lives in Winnipeg’s rivers. 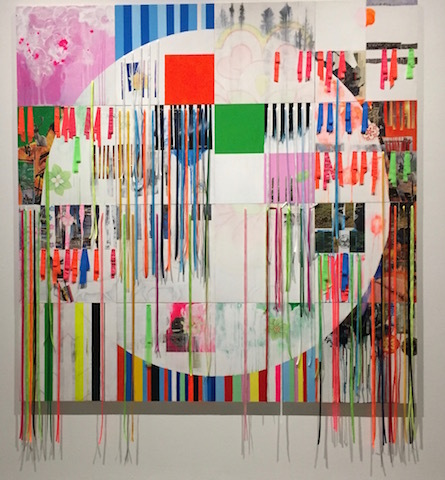 This week when I go to the art gallery the works that formed the Insurgence/Resurgence exhibit will be gone but they won’t easily be forgotten. 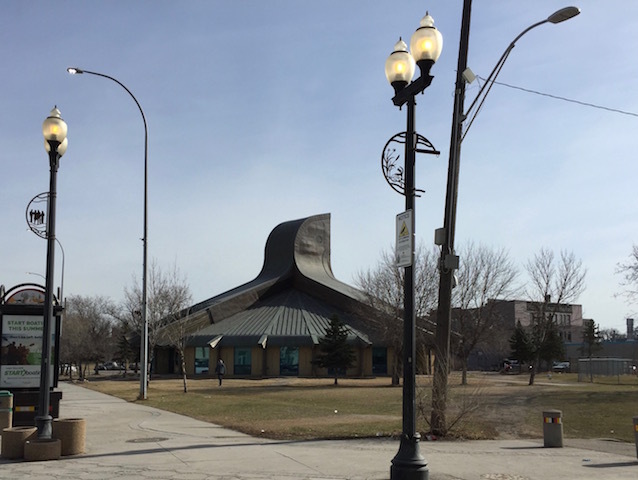 An article in Saturday’s Free Press makes it clear the exhibit will have a lasting impact on the city of Winnipeg, the Winnipeg Art Gallery, its staff and visitors.